Racquetball is one of the most entertaining games you can play. But how do you play racquetball? What makes a singles game of racquetball different from a doubles competition? And how do you go about with the serve in a match? The rules of racquetball are often hard for people to figure out because of how intricate the game is. But the process of how to play racquetball is not as complicated to work with as you might expect it could be. You will enjoy the excitement that comes with this game when you understand how you can play it. The goal of racquetball is for a player to win a rally, which is a point when the ball is in play. A person can win by serving or returning the ball well enough to where the other player is unable to keep the ball in play. A player must be able to hit the ball on a return without the ball hitting the floor twice. The player must also produce a return that hits the front wall before it can touch the floor. The process for how to serve in racquetball entails multiple steps of value. The serve that starts a point works with the server standing in the service zone on one’s end of the court. The service zone is located just before the midway point of the court. The server will let the ball bounce once before hitting it towards the front wall. The ball must deflect off of the front wall and move beyond the service zone. The event will start the rally. The players must avoid entering the zone past the receiving line until after the ball has crossed that line or has hit the floor. After this, the entire court will be fair play for the two sides. The rally is the point where the two players will alternate between each other when hitting the ball. Each player must return the ball before it can hit the floor twice after contacting the front wall. A player’s return must also touch the front wall before it can reach the floor. It is possible for the ball to touch the side wall or back wall when completing a serve or return. But the key is to ensure the ball does not bounce on the floor twice. A player can also hit the ball on as many walls as needed, including on the ceiling. The only key is that the ball touches the front wall before it can touch the ceiling on a return. The lines on the court will not make an impact during the rally. The lines are designed solely to illustrate the serving process. 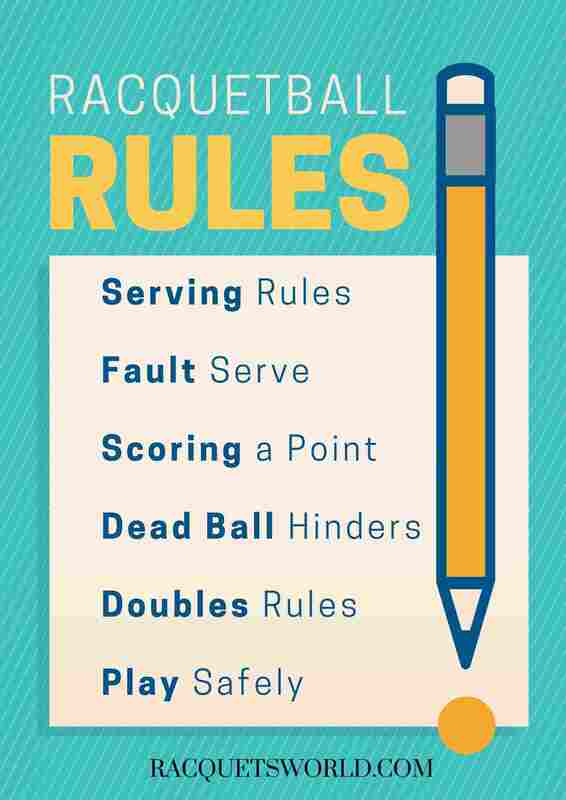 What Is a Fault Serve? A fault serve occurs when the server in a match is unable to complete a good serve. In this case, a good serve is one where the ball lands over the short line and only bounces off of the front and back walls while bouncing on the floor once in between. A fault serve can include one where the ball does not land over the short line, one where the ball hits the ceiling, a case where the ball hits more than two walls, or when the ball hits the back wall before it hits the floor. An out serve is one where the server will lose one’s right to be the server, thus transferring that role to the other player. The most common out serve occurs when the server commits two consecutive fault serves. An out serve may also entail a server swinging at and missing the ball during the serve or when the ball does not hit the front wall first. Any case where the ball leaves the court before hitting the floor is also an out serve. The server is determined at the start of the game through one of many routines. A coin toss may work, but the two players may also lag to see who can complete a hit within a particular distance on the court. The server will continue to serve until that person hits two fault serves in a row or one out serve. The server position will also switch if the first server cannot keep the ball in play after the opponent returns the serve. Only the server in a racquetball match can score a point. A server can score by either attaining an ace, which is a serve the opponent cannot recover. The server can also win a rally to earn a point. The retriever must successfully recover a serve and then successfully serve the ball back to score a point. A player must win two games to win a racquetball match. Each game is played to up to 15 points. The winner only has to win by one point. A third game will be played as a tiebreaker if both players win one game. The tiebreaker game goes to 11 points. A racquet must be held with the use of a wrist tether. The protective item keeps the racquet connected to one’s wrist while playing. The tether assists in keeping the player from losing control of the racquet while playing. In case you’re a beginner and don’t know how to choose a racquet, make sure you read our blog post. A forehand grip may be used in a match. This grip entails the thumb and index finger held in the middle part of the grip to produce a V-shape. The grip should be held closer to the base of the racquet than to the face. A firm grip is a necessity, but the key is to keep a strong reach at all times. A backhand grip is the second option for holding the racquet. The racquet will rotate in a clockwise direction while the same V-shape hold is used on the body of the racquet. This produces a slight impact where the racquet face is laid out differently. Each person in a racquetball match must wear the appropriate eye protection to keep oneself from being harmed during a match. The eye protection may include proper goggles. Racquetball is a game where you need to move around the court frequently, and sometimes you land on the floor using your hand. It may cause the discomfort in your hand and sometime you might hurt your self in these process. In this situation to get rid of it, Some Pros suggest using racquetball gloves. It also helps to have a good grip on the racquets and especially for those who used to get a lot of sweat while playing. A dead ball hinder is a case where some event happens on the court that keeps the players from having a fair shot at returning the ball. A hinder like this results in the rally being replayed with no penalties levied. A dead ball hinder can entail a case where a ball hits a grate or other surface on the playing field that was determined ahead of time to be a court hinder. This is due to such surfaces causing unusual bounces. Other cases of a dead ball hinder include instances where the ball moves in a position that prevents the competitor from safely moving about or when outside interference gets into the court. A safety holdup may also be requested if the situation calls for the play to be hindered due to there not being enough room for players to hit the ball without risking injury to one another. An avoidable hinder occurs when a potentially intentional violation occurs. The server or receiver loses the rally when an avoidable hinder occurs. The most common avoidable hinder is a case where a player inhibits a competitor’s ability to move. This includes instances where someone interferes with a player’s ability to complete a stroke. Pushing, intentional distractions, events where someone intentionally moves into a ball to be struck by it, and flagrant blocking are all avoidable hinders. Cases where a player loses one’s equipment can also be interpreted as avoidable hinders. Such instances are avoidable as the player did not have to lose one’s equipment or should have had the proper safety considerations in mind when playing. The points discussed so far have been mainly about singles rules in racquetball. The rules for doubles racquetball are slightly different. To start, the serve works differently in doubles racquetball than it does in singles. The partner of the server must stand with one’s back to the side wall. The doubles box is on the side of the court and should be utilized within the serve process. The feet must be within the service box. The partner can move around the court when the ball has gone past the short line. A side in doubles is retired when the two partners have lost the service of the ball. That is, both players on the side should have been given the proper opportunity to serve the ball. When they commit too many faults or are unable to return the ball, the other team will serve. A fault in doubles racquetball can entail a server’s teammate not being in the service box with one’s feet on the floor and back to the side wall. Also, a served ball that hits the teammate is considered to be a fault. The ball will still be in play if one player on the doubles team misses the return. The key is for the other person to make the return provided the ball does not touch the floor for the second time in the process. Either way, the two people on the same side have the equal right to return the ball. I hope this article able to answer you all queries regarding the racquetball rules. Let us know in the comments section if you have any queries. We would love to feature your quarries answer in our next update.